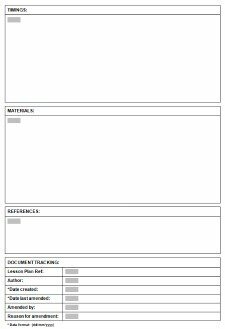 Use this free template to record all your TEFL lesson plans. You will need Microsoft Office Word 2003 or later. Click on the image below to download the template as a Zip file. Page Setup: A4 - Portrait. 2 pages. If you do not have Microsoft Office Word 2003 on your device you can use this printable TEFL Lesson Plans template available to download as a PDF file. Planning lessons can seem like hard work especially if you do not organise them in a consistent format. A standardised template format will help you to think about all the required components of a lesson, ensuring that nothing is over looked. It will organise your planning, help you to focus on what you want your students to achieve and act as a valuable reference for future lesson planning. The more it is used, the easier lesson planning becomes. When you open the Microsoft Word template file it will open as a new document ready to be used. This will happen each time it is opened. The document has been protected to only allow you to complete the grey boxes. These grey boxes are known as Form Fields. You can tab from one form field to the next or use your mouse to navigate between them. You will not be able to amend any other part of the document unless you unprotect the document first. To enter information into the document click into a grey form field and enter text. You will notice that some of the form fields are selection lists. Simply select an option from the list and the document will be updated with your selection. If you wish to amend the options available from a selection list or amend any other part of the template click here for more information about amending Microsoft Word 2003 templates. The TEFL lesson plan is divided into sections to clearly define the different components to consider when planning a class. Sounds obvious but give the lesson a title that is memorable and interesting. Don't worry about trying to provide too much information to describe the level or content of the lesson as the Profile section allows you to do this. 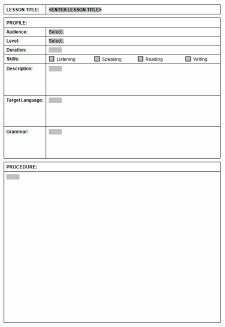 The Profile section has been designed to record the detail of who the lesson is aimed at, how long it should last, what are the language skills your students will be working on, a description of the lesson and the target language and grammar to be taught. Lessons are usually aimed at a particular audience, more often than not defined by their age group. For example a TEFL lesson plan set in the context of a bank is unlikely to be relevant to young learners. In the same way a lesson set in the context of the playground is unlikely to inspire all adult learners. Admittedly some adult learners will be parents and hence may have an interest in the playground but it may not be for all. Now you have established your audience you will want to determine the ability level to ensure that the language skills, target language and grammar are relevant to your students. The amount of time the lesson is expected to last. Enter a description of the TEFL lesson plan. Enter enough detail to set the context of the learning activities. Where are the participants? Are they performing role play? What will they be doing? What is the time reference? Present, past or future? Identify the type/s of language and vocabulary you want to cover e.g. Asking for directions. Where is...? How do you get to...? Excuse me. Identify the grammatical structures you want to teach e.g. the present continuous in the 1st person. Detail how the lesson will start all the way through to conclusion. Think how the context will be set and how and when your target language and grammar will be introduced. Think about who will be doing what and when and consider the class materials that will be required to allow the actions to happen. Try to maximise the time for your students to practice the language skills. Allocate time to each main activity. Without considering your timings you will not know if you can fit the lesson into the time allowed. Trying to allocate time to every single detail identified in your Procedure is probably not a good use of your time. Try to estimate the overall main activities. List here any class room materials required e.g. printed handouts, flash cards, props, CD player and music, television, DVD player and DVD's, text books, projector, laptop....etc. Record any sources of information used to help you put together the lesson plan. Text books, websites, TV programmes etc. This section is of particular use for English schools who want all their teachers to use the same TEFL lesson plan format. It provides visible control of each lesson plan thus allowing an audit trail. Even if you are using this template format on your own, being able to refer back to when you created it, when you last amended it and why, is useful information. The BBC Learning English website is an excellent source of free TEFL lesson plans covering modern English expressions and vocabulary. It provides a variety of teaching ideas on topical issues and events. Lesson plans can be downloaded as PDF's, together with audio files in MP3 format ready to take to class and play on your phone, tablet or PC. Complete lessons available to download for free...well done the BBC!